The main intention for Fotofly was to create a WordPress Theme for photographers, bloggers and designers that would give a maximum creative freedom for users not deeply involved in design & coding. The result is impressive with its outstanding unique elements and options. It has so many options that we even coudn’t count them. Which means it gives you full freedom to create your dream website. It’s a wordpress onestop tool for photography, and truly easy to use. Long awaited option by customers: Now you can divide your portfolios to different pages(like: personal, editorial, commercial,…) with Fotofly. The theme offers many portfolio layouts too. Which means you can have different layouts for each your divided portfolio pages. The theme focuses your images security. Don’t worry we have covered you. We have disabled any image saving options for browsers. No one can download your images without your permission. You can enable/disable that option. Suggestion: Watermarking your images are the strong defense as always. The theme is ready to be translated in any language possible. We payed fine attention to code detailes and left room for a great integration with WPML. WooCommerce is currently the most popular online shopping platform and Fotofly is strongly integrated with it including its sleek and gorgeous built-in styles. So, while Fotofly handles the visuals, WooCommerce, with it’s enormous plugin library, will cover almost any existing eCommerce functionality. 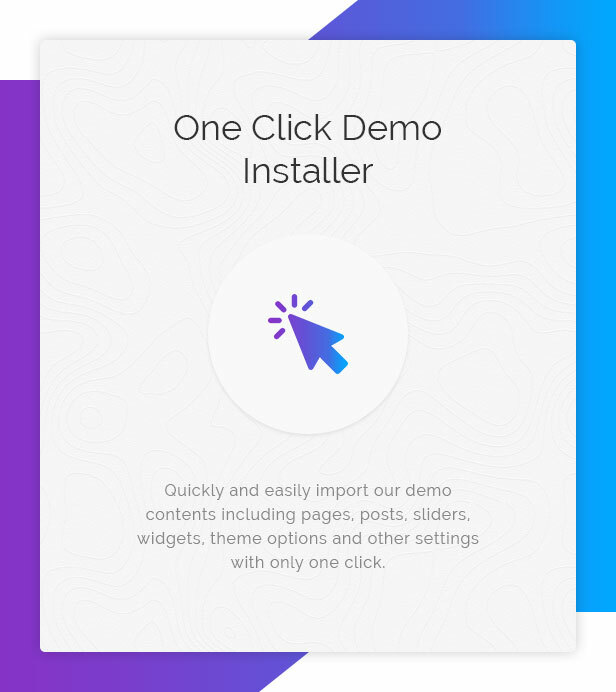 With just one click only, you can replicate our available demo and enhance the development process. Unlike other photography themes, Fotofly includes much needed content elements designed to showcase your business’s best of itself. There are literally, endless possibilities. Among many reasons, what makes Fotofly so special is the large number of built-in features and integrations. Again, we love “before the fold” areas! They should be spectacular and they should be as actionable as possible to convert any potential visitor to a loyal customer or subscriber. Content marketing is the current “thing” and should be treated as such. Blog about the latest news and updates of your company, simple stories stories or entertaining content for your visitors and subscribers. Your projects deserves the best showcase. Fotofly includes several highly customisable portfolio layouts for your business’s projects, so that your website visitors will actually see the amazing work you’re doing. With Theme’s “pricing tables” element you can easily showcase your services with their specific prices and features, on the fly, with personality and customisability options. 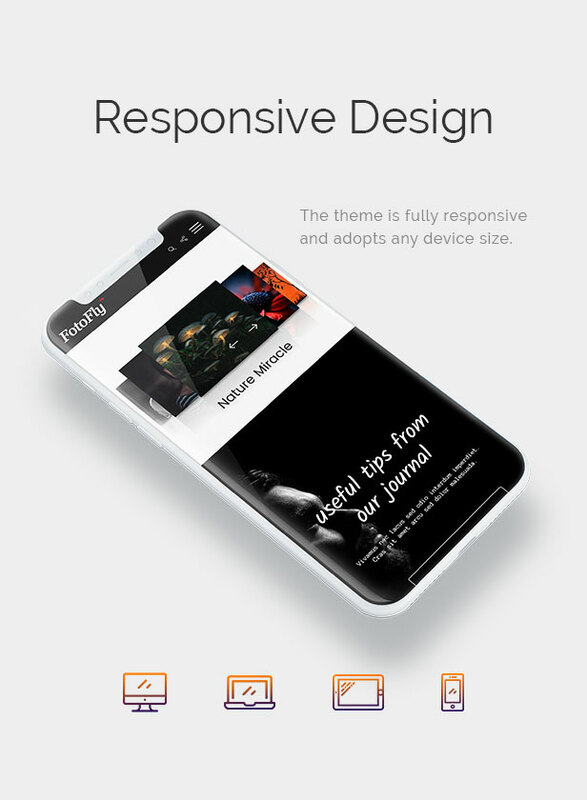 The theme, at its core, has a compliant, modern and future proof HTML5 markup and CSS3 styling. The theme offers you the ability to create awesome One Page websites with stuning Parallax effects. Each Theme’s feature is backed out with a video. Whether you are an expert or a beginner, our Support Team will do its best to provide the best possible and helpful answer for the issues that you are having. You can individually customise header layout and type, footer, sidebar and numerous other setting for each page/post/project/gallery/etc.